Bangalore brocades are characterised by vivid tones, the pure silk of the make, and luxuriant booties punctuating the embroidery. This vibrant number is a fine example of what is known as the fashion saree of the South, and is fit to be worn to dinners and evening parties should you team this with the right gold and jewels. In imitation of the interlocked-weft sarees woven in and around the Tamil-speaking region, the wraps and wefts of the Bangalore saree is dip-dyed prior to being woven on the loom. This results in the inimitable finish of the dye on the pure homegrown silk of the fabric. Supplementary warp threads a couple of inches wide complete the weave on the field and the border. 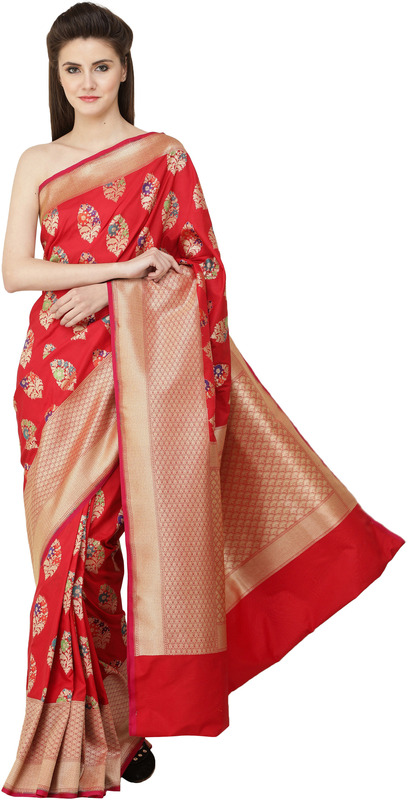 This is one saree that would ensure the eyes of onlookers are glued to you all evening. The border of gorgeous gold zari becomes thicker along the pleats as it nears the endpiece and emerges into the signature endpiece. The superfine embroidery is such as to look against the wide variety of colour variations this ensemble comes in. What sets this saree apart from the rest of the Bangalore brocades in our collection are the complex booties across the field - a closed-in gathering of gold foliage featuring a bunch of pastel-coloured petals in each booti. Paired carefully with the jewellery, this saree would turn you into the life of the party.